The Cooking Photographer: Migas. A Tex-Mex Breakfast. Sitting around this snowy Sunday morning with my soymilk laced coffee, fruit and too healthy whole-wheat mini bagel makes me wish I had a big plate of these Migas. Then again, I’d also like my friends Cliff and Mari to come back and make them for me! My favorite Texas-to-Montana transplant couple recently spent a weekend with us. 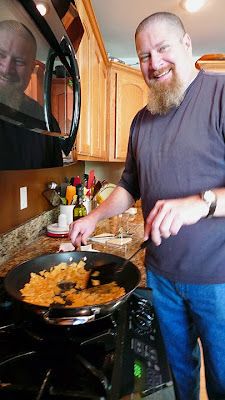 Now, we always have people visiting, but so far Cliff is the first to throw me out of my own kitchen! “Sit down and relax. Have a cup of coffee.” Mari repeated to me several times. Instead I sort of paced and whimpered, as sitting isn’t exactly my specialty. It was out of exasperation they finally relented and allowed me to shadow Cliff the Cook and take some pictures. I have to say though, as soon as the migas were plated I forgot all about taking final shots and instead dug into the best darn migas I’ve ever tasted. Cliff makes mine look like a silly imitation of Tex-Mex. Which they are of course. I mean seriously, what was I thinking making vegetarian olive oil based migas anyway? Cliff has his own blog Somewhere in the Middle of Western Montana, and is in the middle of writing a book about his adventures in the wilds of the west. He’s my version of the ideal person to live in Montana; part stoic mountain man part over educated ex-attorney. His ramblings are funny, masculine and completely himself. I’m looking forward to a signed copy as soon as he’s published. In a larg e frying pan, cook the 8 pieces of bacon and set them aside, leaving the bacon grease in the pan. 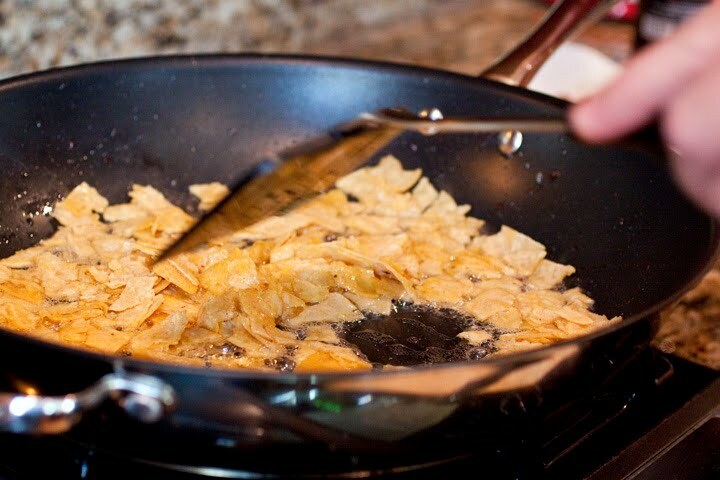 Tear the tortillas into small bite-sized pieces and sauté them in the bacon grease until they are crispy. Remove the tortillas and set aside (you can leave them in, but they'll get a little soggy when you add the eggs). In a large bowl, combine the eggs, tomato, jalapeno, garlic powder and onion powder and whisk together. I never measure the garlic or onion powder. I just add a couple of healthy shakes of each. Pour the egg mixture into the frying pan. 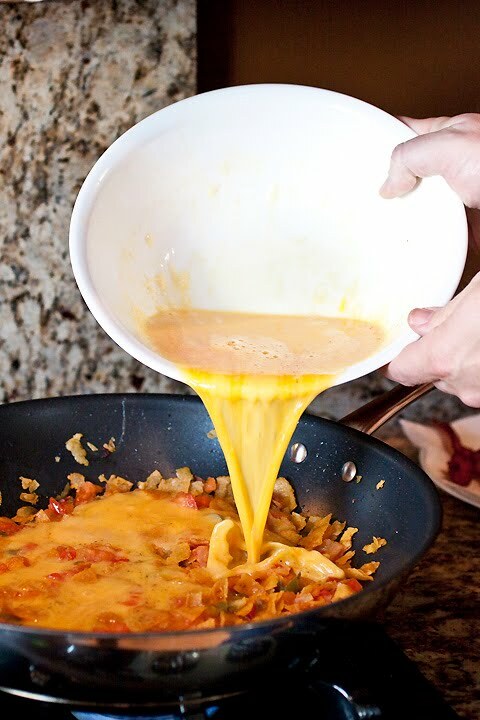 When the eggs just start to firm up, add the tortillas back in and mix them in as you finish cooking the eggs. I crumble the bacon on top of the migas when they're done. You can also add shredded cheese, but do it while they're still hot in the pan so the cheese will melt. Options. If you use oil instead of bacon grease, you'll need to add salt, maybe 1/2 - 3/4 teaspoon. If I'm feeling industrious and have everything on hand, I'll add some chopped onion and minced garlic when I'm sautéing the tortillas (let the tortillas get a little crispy first). If you do that, you can skip the powders. To make these perfect, you should have some refried beans as a side, but I almost never do. It takes too much planning to cook a pot of beans and then fry them up. My migas are usually more spur-of-the-moment. Recipe by Montana Cliff @ Somewhere in the Middle of Western Montana. Pictures by Laura Flowers. Oh how I wish I had a plate, I love it when a guest kicks me out of the kitchen! Those sound wonderful! My Aunt Karen used to make something very similar. Maybe it actually WAS Migas and I was just too little to know it. I'm going to try this out! I've never had Migas:( These look delish and sound worth a try! 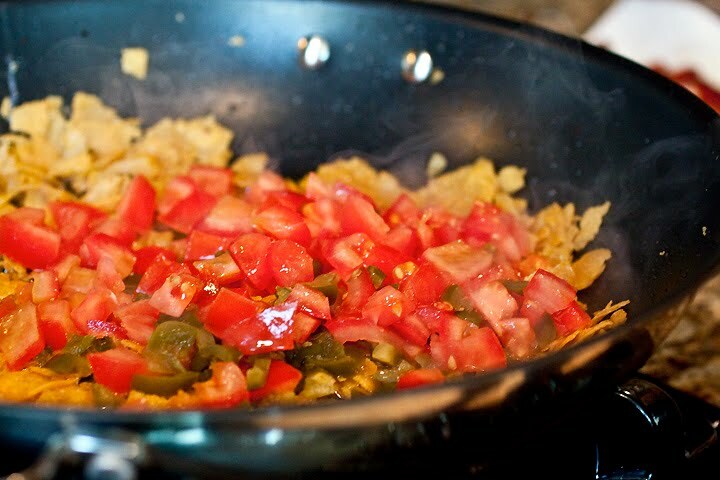 I have never had Migas, or even hear of them, but I want to make them now. It sounds so good and I am sure every calorie is worth it. As a new Montana girl (2 years and counting)who just built a cabin in the Rockies, I was pleased to see a fellow Montanan out there cooking. Thanks and the Migas sounds/looks great! Hi Laura, Happy New Year! I've never had migas before but great introduction and very timely. Hubby heading to Austin for a conference soon and is looking for food he should try. Any other suggestions? Btw, wish I had guests who'd throw me out of my kitchen and make me breakfast! We are so glad that our Southern friends are spreading their Texas hospitatlity up North! Your description of Cliff was "spot on!" We certainly miss him here in Dallas! I've been looking forward to this! I love ordering migas at restaurants here in Texas, but I've never made my own. How silly, I know! This is such a great and simple recipe. Thank you for sharing it with me. I hope you had a lovely Monday. I am trying to stay warm in Austin…we finally got a cold snap down here! What a tasty, hearty breakfast, Laura. I can tell just by lookin that my boy would scarf this down. Fantastic! I've never heard of migas but this sounds sooo good. Hearty and delicious!